Election Commission of India has announced the dates for Indian General Elections – 2014 wherein 81.4 crore Indians will start casting their valuable votes to constitute 16th Lok Sabha in India. Voting will start from April 7th and end on May 12th, divided into 9 phases. Counting of the votes will start from May 16 and by the end of May, formation of the new government will be decided. There are total of 543 parliamentary constituencies in India, and the winning party or coalition needs 272 seats to form the next government of world’s largest democracy. Street fighting broke out in Delhi, Lucknow and Gujarat as Chief Election Commissioner V.S. Sampath announced the dates of world’s most complex management exercise. 814 million registered voters are more than the entire population of Europe, and this event itself is a world record. This is the longest phase of elections ever witnessed in India or anywhere else in the world. Compared to last elections in 2009, 9.7 crore new registered voters have been added to the overall electoral list. Interestingly, 23 million or 3% of the total voters are within the age group of 18-19 who are heavily influenced by the social media, and can prove to be a major game changer. Total of 12 lakh electronic voting machines will be deployed across polling booths, and the total expenditure to Government will be around Rs 3500 crore. Millions of staff and a solid police force of 120,000 will be dedicated for proper management and execution of this gargantuan event. The voting will happen across the length and breadth of the country, right in the deserts of Rajasthan to tiny islands in Indian ocean. The Election Commission of India has assured that no person needs to travel more than 2 kms to cast his vote. Every candidate can only spend Rs 70 lakh on promoting themselves, so that candidate gets a level playing field to contest the elections. In this election, 28,314 voters have identified themselves as transgender, and their sexual preference has been recorded as “Other”. Hyderabad & Ahmedabad on April 30th. If you are unable to view following file in the browser, you can click here to view. #Elections2014 are going to be a spectacle this time around! 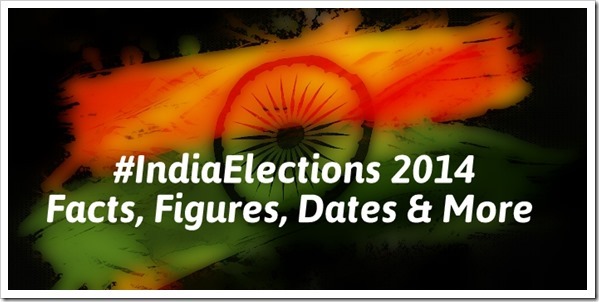 "Indian Elections 2014: Facts, Figures, Dates & More...", 5 out of 5 based on 1 ratings. Walmart Goes Back & Forth; Now Plans To Launch Online Marketplace In India! You could have made a infrographic out of all the info available. I noted two points which I wanted to point out. What surprised me is out of the tens of millions of NRIs all around the globe, 11K+ registered for voting. 2) The file which shows all 543 constituencies has some error. Have you noticed Andhra has only two seats (the first two places in the list) while there are 42 seats in Andhra. I think the list missed first page and started from second page.